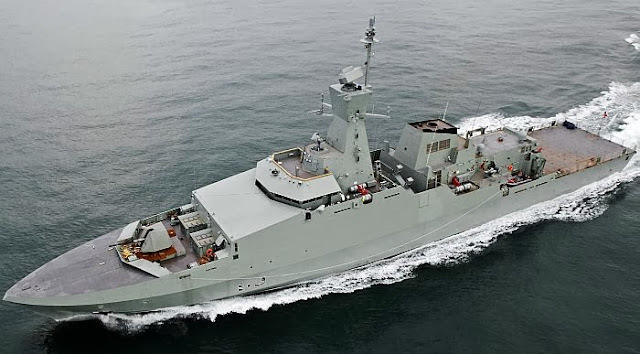 The Royal Navy of Oman (RNO) has recently accepted a new corvette – Al Shamikh – the lead ship of Khareef class. The 99 meter corvette has a displacement of 2,660 ton. 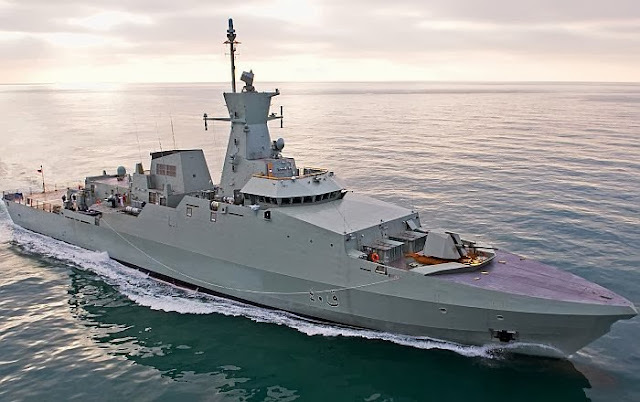 It was constructed by BAE Systems at Portsmouth, UK and is designated ‘Ocean Patrol Vessel’ (OPV). Al Shamikh was launched in 2009 and accepted by the Royal Oman Navy in the UK June this year. Work at Portsmouth continues on the other two vessels of the class – Al Rahmani and Al Rasikh. As part of the sea trials that followed the vessel conducted an operational naval firing of its VL MICA anti-air missile. Al Shamikh is the first deployment of the MICA VL Marine (MICA VL M) missile system, developed by MBDA. The live firing took place at the French MoD’s test range off the coast of the Ile du Levant in the Mediterranean Sea under the supervision and control of the French DGA – EM (Direction Générale de l’Armement – Essais de Missiles). According to MBDA the VL MICA missile successfully intercepted and destroyed at very low altitude the target which was simulating a sea skimming anti-ship missile. “The success of this firing is evidence of the operational capability of the RNO with its new vessel and weapon system.” the announcement added.